It seems we suffer a similar process. I still think you’re wonderful anyway. Substitute the video games with the even less productive act of watching cartoons and sketch tv and you have my process. The vortex can take many forms (although I think watching cartoons is probably more productive!). If you’re really lucky it can even make you do housework! I know this – this is the spiral I get caught in everytime I try getting back to making art! I’m not alone!! YAAAAAAYYY! Hurrah! Wait – I clicked on your user name and it took me to a site selling v1agra. Damn you! Hrm. Fixed it. Now it’s back to the swearing and crude pinko propaganda. Too, too true. WHY DO WE DO THIS AGAIN????? We can always hope to land on that lucky ‘sweet release of death’ space. Maybe next time round! This is amazing! I just need to switch out “video game vortex” to “wasting time on the internet” as my biggest loop and it closely mirrors my process… I also love the self doubt goblin. What video games are you wasting your time with these days, and what system are you on? gosh! comics has new digs! 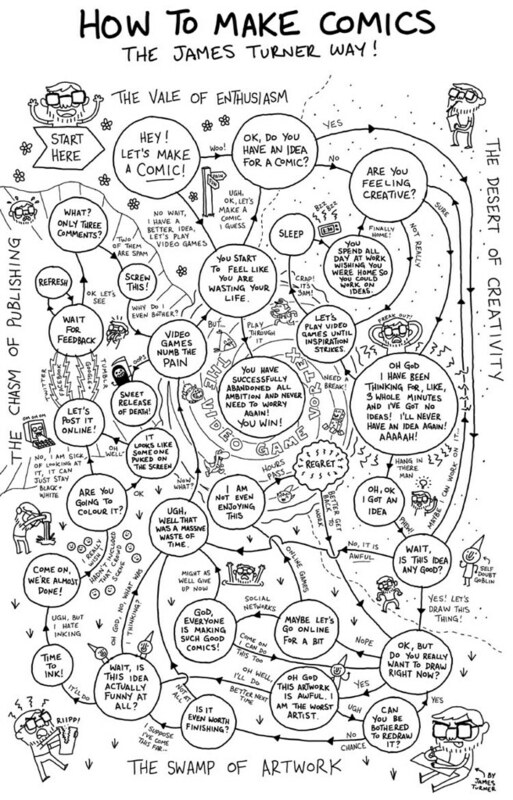 A friend just sent me a link to this and you have perfectly summed up the creative process. So that leaves me sitting on the “God everyone is making such good comics!” space.